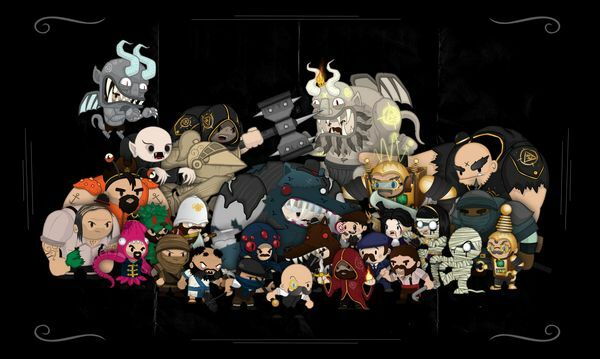 At heart, Foul Play is a solid, combo-based brawler. While the game may seem “easy” given that you cannot die, getting the top rating on each act will likely require a lot of practice and replays. Visually, it is a treat, and the humour running through the game is key too. 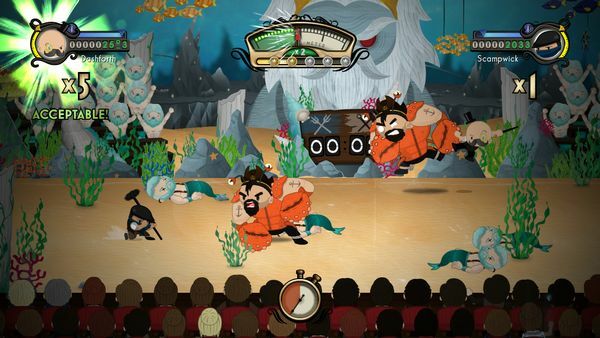 The game is looking to create the idea of an evening’s entertainment on stage, and in turn creates several hours of entertainment for the player. Performing live on stage must always be nerve-wracking, but even more so when this involves thrashing the gentlemanly hell out of waves of opponents. Nevertheless, this is the task ahead of Baron Dashforth as he relates tales of his past daemon-hunting adventures in Foul Play. Wait, did I say enemies? That should be “extras”. The game’s central theme – that the events are happening on stage – is at the core of the experience, and also providing a lot of the humour. Monsters wear deliberately patchy costumes, and tend to crawl off of stage when “defeated”; just as prop men are sometimes caught out-of-place setting things up (or having a sneaky cup of tea where they shouldn’t be). This also extends to a core game mechanic – you cannot die. While the gameplay could be compared to side-scrolling beat-em-ups of yesteryear such as Double Dragon or Final Fight, you do not have a health gauge to worry about and only “lose” if the performance goes so badly the audience give up on you. Otherwise, as long as you can keep some excitement going – even in a patchy fight when you just cannot seem to avoid incoming blows – you will still be able to progress. The audience know what they want to see though – flashy moves. Your basic skills – a light attack, heavy attack, parry button for counters, a dodge and a jump – can be strung together for combos and mid-air juggles, or to grab hold of attackers and perform counter-attacks such as powerdrivers or throwing them into others… and as this happens, you will hear shouts and cheers, even seeing hats thrown into the air in celebration when doing especially well. On the other side of this, taking a blow can be terrible for audience morale – it can end a combo counter, as well as drop the mood-o-meter telling you how much they are enjoying the whole affair. Just as performing consistently well will raise it and keep the show going, let it drop too low for too long and the curtains will fall. So, it’s fine that losing is hard to do. Given a little perseverance you’ll make it through the game’s five plays – but is there a challenge? Well, yes. 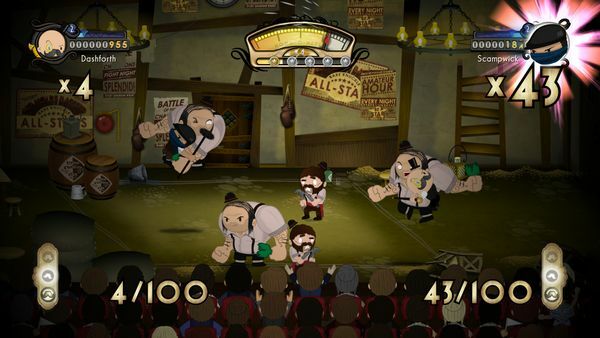 There are 22 stages in total making up the plays, all of which are scored with a star rating out of five given on completion; there are also challenges on 17 of these, usually setting things to do during that act – such as throw enemies into each other a certain number of times or to achieve a high combo during a specific fight. Completing every challenge in an act will unlock a lucky charm, two of which can then be equipped between acts for extra benefits, such as keeping the window for continuing a combo open longer, or the audience losing interest more slowly. Replaying earlier stages with later gained skills and charms is often going to be key in getting the top rating and completing every challenge. The game is laced with humour – the gentlemanly attitude exuded by Dashforth compared to the more street-educated Scampwick; seeing monsters forget their lines and need prompting; hooks pulling the defeated off stage; even just the absurdity of some set pieces (let’s just say that the revealing of what “nature’s greatest mistake” is did actually make me laugh). This extends into some of the game’s extra content too, as completing acts tends to unlock pages of various books which can be read from the main menu and these – Scampwick’s training manual especially – also tend to carry the same sense of humour across. Aurally, the game is a treat. As well as the audience cheers or jeers, the musical accompaniment is meant to sound like that – lively piano pieces being a common one, although some stages have bigger pieces with little nuances – listen out for hints of “London Bridge is Burning Down” and the sound of Big Ben’s tolls mixed into the London stage’s soundtrack, subtly adding to the setting. There also plenty of audio cues too – some attacks can heard as well as seen coming, gauges and bars make sounds when they fill, and so on. If you are willing to trust your ears as well as your eyes, it can aid you immensely. At heart, Foul Play is a solid, combo-based brawler. While the game may seem “easy” given that you cannot die, getting the top rating on each act will likely require a lot of practice and replays. Visually, it is a treat, seeing sets change around you and opponents in tatty and absurd outfits; although groups of enemies – especially larger ones – can also hide the player. The humour running through the game is key too – in the written dialogue, enemy details and with small events happening in the backdrops. 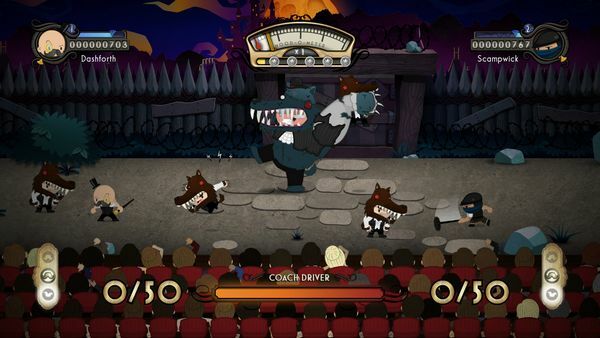 The game is looking to create the idea of an evening’s entertainment on stage, and in turn creates several hours of entertainment for the player. Foul Play is released tomorrow, September 18th, for the 360 via Xbox Arcade, and for PC via Steam.